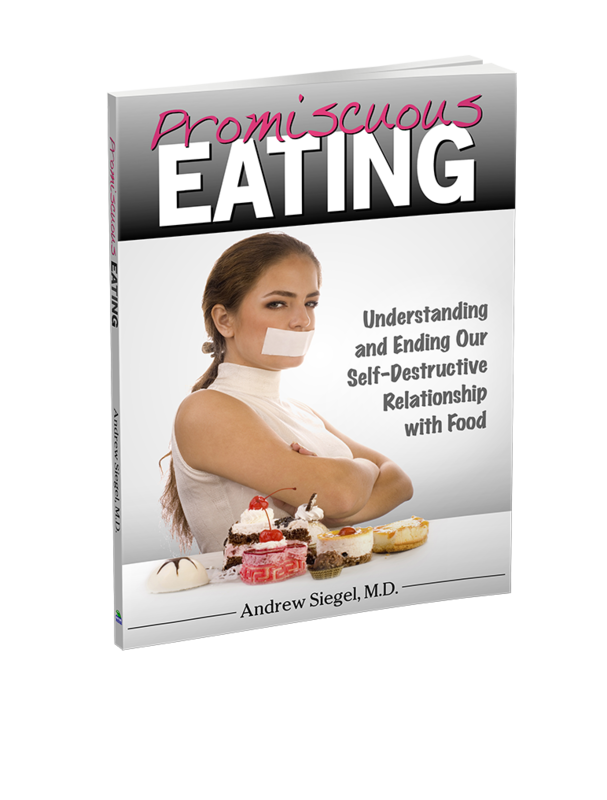 Promiscuous Eating – Andrew Siegel, M.D. Dr. Siegel’s second book provides you with the insight, tools and motivation that are needed to develop a more harmonious relationship with food...and to ultimately take control of your own health destiny. Animated by illuminating vignettes of the real-life eating behaviors of men, women and children interviewed by the author, Promiscuous Eating examines one of our most intimate relationships: that of our relationship with food. For far too many of us, this has gone awry, culminating in a multitude of health-damaging issues that can sabotage the quality and the quantity of our lives. Eating for the wrong reasons? Eating without regard to consequence? Eating at the wrong times or places? Eating too much or too rapidly? Now is the time to take control of your health destiny! A wonderful, much needed, highly readable and informative book. Everyone can relate to it, if even in secret with just himself or herself admitting to these behaviors. I try to follow these guidelines and be mindful. This last year I have been obsessed with food, due to the insulinoma I have. It is indeed carbs that do all kinds of bad stuff. I eat only whole grain, fruit and so forth and have gained a lot of weight but luckily was thin at the start. The good news is that the high insulin, low blood sugar has just about returned to normal these last few weeks so I very excited to return to be able to return to normal eating. I was leaning against my kitchen counter for a couple of hours yesterday reading your book, not intending to do that but got sucked into it the more I read it. I think it's a wonderful book, very informative, true and beautifully written. Another enjoyable book! The title is excellent, very captivating. I enjoyed the interviewed statements, your personal anecdotes, and I may never eat another hamburger again - probably not such a bad thing. The timing of reading the book could not have been better because I think that it will help me go through Passover without too much damage. I am looking forward for the next one. Organized and informative, written with humility, a simplistic rather than vague style and a generosity of self-revelation in an effort to make points to readers. Phenomenal…a life changer! It really hit home with a lot of issues that people deal with everyday, myself included, but don't want to talk about. I really love how you put actual quotes from real people in there. I keep the book with me at all times for motivation because I recently broke my bad food habits back in January and am now working out five days a week and playing racquetball twice a week. So once again I will like to say THANK YOU, THANK YOU, THANK YOU!!!! !